Tiger Woods security guard: Best reactions to bizarre golf moment. Tiger Woods getting tripped over by a security guard was just one of the most awkward things we’ve personally seen happen… lately. The second round of the Masters in Augusta saw Woods take a shot from the trees to the par-4 14th hole, when a member of the Georgia Bureau of Investigation tried to prevent patrons from getting too close to the 14-time major winner. But… the man himself got too close. Oh… no. 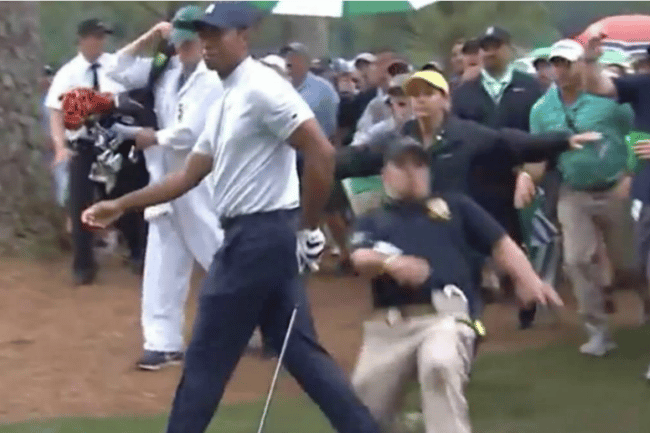 Watch a security guard awkwardly fall onto Tiger Woods. Post continues. He tripped onto perhaps the greatest sportsman of our time, nearly taking him out in the process. Woods, who has a history of injuries including a torn ACL, limped in pain for several metres while everyone held their breath. No one at all has asked how the security guard is going. Here were our six favourite reactions to the most awkward moment we’ve seen in golf for a while.